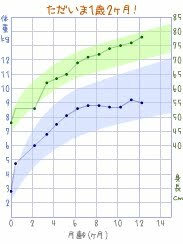 Marcus is now 14 months old and 5 days.. above is his growth chart.. he growth start to slow down since he is 6 months old.. Physical - although he is already 14 months but he still not start to walk yet (walk without holding anything i mean).. he walking with a plastic chair.. walk real fast one... cruising almost everywhere in the house.. he is crawling on all four.. climb up and down from the coffee table, bench, staircase.. using fingers very well - pincer grasps - grip tiny things (finger food and put inside his mouth).. play taking this inside and outside from containers.. he will shake his head to say "No" i dont want eat!!! Feeding himself with fingers.. very good hand eye coordination.. he now know to wave bye bye.. say hi.. and twinkle twinkle little star.. clap hands..hahaha.. pointing finger on everything he want.. Language - he can say mum mum - eating which he really meant it.. nen nen but still dont know what is his meaning about this word.. and he can express what he want clearly even without talking clearly.. like he want to blanket.. he will eh eh and point the blanket..
Sleep - he still consider sleeping through the night.. from normally 10pm to next day 8am something to 9am.. but in the middle of the night he will wake up occasionally and look for his pacifier.. Eating - HE GOT 6 Teeth still.. he is doing much better in term of eating.. he like to eat rice!!! and we found that he got allergy to pineapple.. for milk intake.. he still drink only after he sleep and about 2-3 times a days.. around 3-5oz each time.. still not meeting the minimum requirement of 16oz per day.. i really hope one day he will drink milk with open eyes..
Potty training - we start him on potty training without we realize it... when we saw he like want to pang sai.. then we will take the potty and put his buttock.. he will complaint and complaint if we do so..